The recent e-newsletter from Caribbean Vision Ministries (Chuck Davis, executive director) reviews a recent visit from a ministry team from Grace Polaris Church (Mike Yoder, lead pastor). Dustin Speaks, who is the local witness and mobilization pastor at the church, is quoted. A portion of the newsletter appears below. If you’d like to learn more, Click here to read the complete newsletter. Also check out the Caribbean Vision Ministries web page, where you may also subscribe to this newsletter. 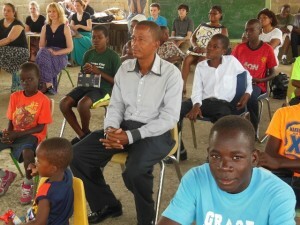 The leader of the team, Dustin Speaks, said in his blog, “We didn’t go to Haiti as their Saviors. We didn’t go to lead them or teach them. We didn’t go to do things for them. Instead, we went to learn from them, to pray with them, to love them, and to serve them. In most cases, these brothers and sisters know the Lord in a much more tangible way than many of us, so we had a lot to learn!” You can read his entire blog at: gracepolaris.org/blog/to-haiti-and-back ). I would suggest you read it. Everyone on the team was serving with us in Haiti for the first time except for Dustin so everything presented a different environment for the team from the temperature, transport, food, housing, language, sleeping arrangements, toilet & shower facilities, people and on it goes. But the team did well, adapted to the culture quickly and began to build relationships immediately. The team worshiped with the children and staff at House of Hope Orphanage on Sunday and Pastor Joly, the Director, shared his testimony of how God prepared him from his youth and called him to be the “father” of all these children. A number of team members shared their testimony with the children as well. After lunch at House of Hope the members journeyed back to the Institute (home base) and prepared for the week. In the evening the team enjoyed a lively church service at Berean Bible Church where the Pastor is Daniel Jean Baptiste, and he is also the Director of Grace Theological Institute. Once again some members of our team shared their testimonies and the entire team sang two songs they had prepared for the congregation. And then the congregation joined in singing with the team in rounds. It was quite impressive. If you’d like to learn more, Click here to read the complete newsletter. Also check out the Caribbean Vision Ministries web page, where you may also subscribe to this newsletter.